There are many Japans. You could visit for the temples and castles. Or you could want to see the crowds and bustle of the cities. What I like are the obsessions of the Japanese. I can walk around all night, looking for little shops which sell rice crisps (see the featured photo), or the vending machines with hot tea and cold coffee, or pachinko parlours with their zombie clients. I love the fact that I could decide to have a haircut after midnight and find a hairdresser’s open. 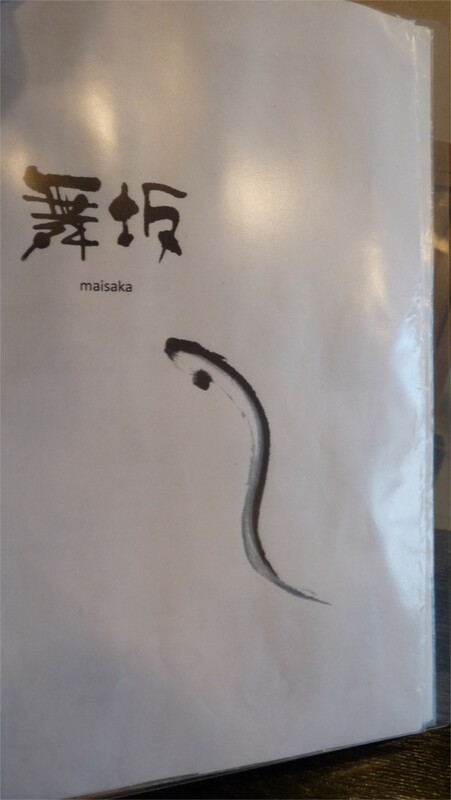 I have wandered through streets, stopping at shops which sell ink and paper, looking at the calligraphy on display. I would love to go back to Osaka and look for the shop which made a name stamp for me. I have a fond memory of a little bar in a basement in Kyoto which specialized in whiskey and jazz. What’s the best season? You can take your pick. Perhaps it could be the middle of winter when the streets are thronged by people in masks, and you have to warm your hands around a flask of hot sake. Or perhaps it is spring when it seems that most of Japan is drunk while the sakura is in bloom. I like the hot muggy summer, so like home, when the sound of crickets (photo above) keeps you company through sleepless nights. Autumn is special, when leaves turn colour in the temples of Kyoto or Nara and you are supposed to spend evenings looking at the moon. We’ll spend only a couple of weeks in Japan next year. I wish we could spend a year there. I’m an avid collector of Japanese sweets, but this is the first time I brought home the Japanese sweets called Kamome no Tamago (Seagull’s eggs). So I was very surprised to find how popular it is (see here, here, and here). Apparently the factory which makes this sweet was damaged in the Tohoku earthquake of 2011, but has clearly sprung back into production. I learnt that the chocolate and cake covering over the white bean paste was a revolutionary idea when it was first made, but the sweet is now a very common omiyage (travel souvenir). I didn’t know that, but I’m happy. So is The Family, and so will my niece be, when she recovers enough from her flu to bite into this. If I have anything to complain about, it is that the white bean paste seems to be a little sweeter than the more common red bean paste. If you are worried about calories, the company has the full nutrition facts on the web. Here’s another lingering piece of Japan. 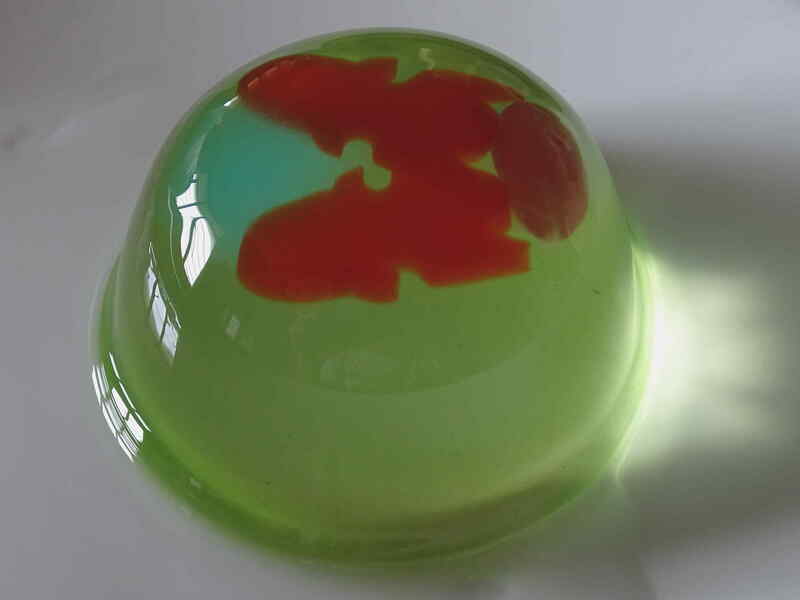 The Family loves these wobbly balls of agar jelly. There are many varieties of these. The particular ones I bought this time have a sweet bean, and some fruit cut into the shape of fish. Does that make it a jelly fish? I realize that I do not know what these things are called in Japanese. A trip does not quite end when your plane brings you back home; at least not when I get back from Japan. For years now, every time I’ve left Japan, it is with a bagful of things to eat, picked up from airport shops. That’s how I first discovered the pleasures of Tokyo Banana and Franz the chocolatier. I brought back honey glazed dried fish, until The Family completely embargoed that; a ban that extends to dried octopus as well. Mochi was our favourite for many years. We distributed boxes of wagashi to our extended family, and these lovely rice sweets with bean-paste filling were widely appreciated. The Family found Yatsuhashi (sheets made from glutinous rice, wrapped around sweet red bean paste) very special. My mother fell in love with monaka (azuki bean jam sandwiched between crisp mochi wafers). My nieces became familiar with the words mochi, daifuku, manju and anko. Opening a box with unreadable writing and tasting what was inside became a family game whenever I returned from Japan. The selection of things available at airports has changed over the years. This time I found very few traditional sweets: dorayaki, green tea mochi and a daifuku. There were a lot of cakes and other baked sweets, sometimes with interesting fillings. I did find a large box of senbei (rice crackers). Usually I pick these up from a specialty shop, but this time I’d forgotten to do that. From Kobe I’d picked up the local specialty: caramel custard (called purin in Japanese). Surprisingly, the caramel comes in a separate pouch! Tucked away in a box of various teabags at home, I found some genmaicha. 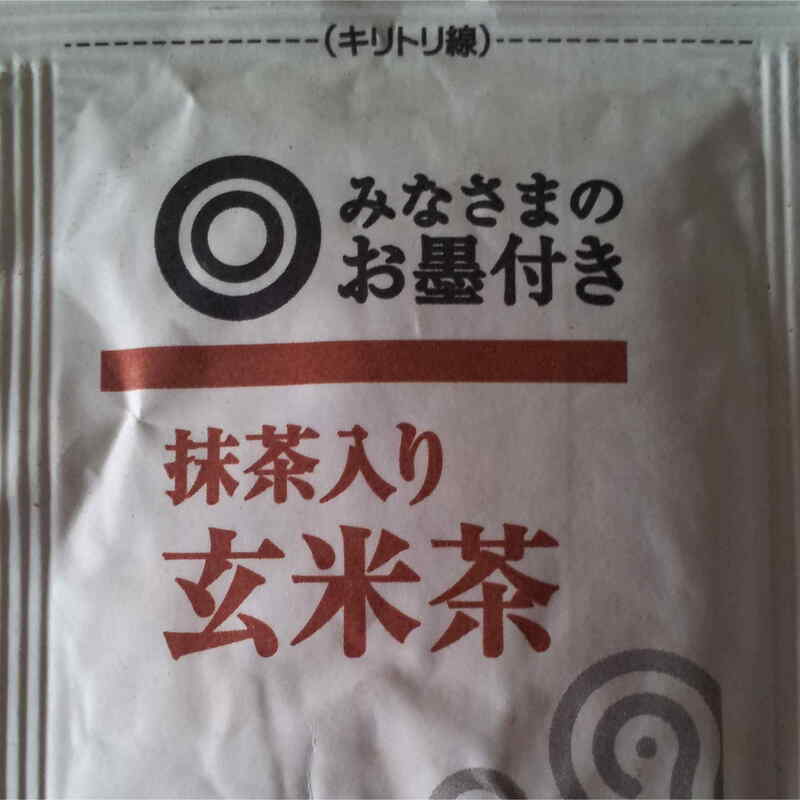 This is bancha (low grade Japanese green tea) mixed with roasted rice kernels. I like the slight nutty taste of this kind of tea. A morning’s snack of senbei and genmaicha is not haute cuisine, but is something I quite like. That’s the photo at the top. Such short armchair trips in Japan will continue for a month or so, as we work our way through the boxes I got this time around. Summer arrived in the last two days before I left Japan. How does one decide? For the record its not by the sun or the stars, nor by the heat and humidity, but by the cry of the cicadas. Japan has a thing about these large and unprepossessing insect, named semi in Japanese, which are supposed to call only in summer. 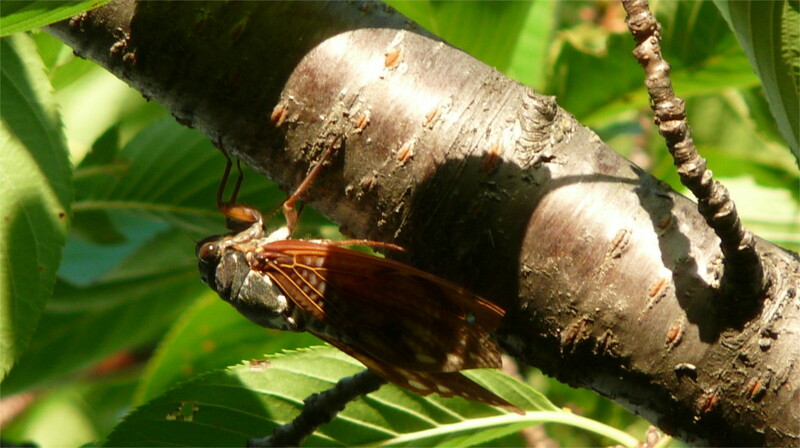 The monotonous ji-ji-ji sound which I heard while walking to lunch was probably the large brown cicada which the Japanese call the Aburazemi. If it makes you feel any better, the Latin binomial is Graptosaltria nigrofuscata. There weren’t too many of them, and it was too early in the season for kids to be out trying to catch them. But a few cicada do a summer make. While cruising in a Dreamliner over Asia at this time of the year one sees nothing except a sea of clouds. Dreamliners fly at an altitude of 12 kilometers, with a cruising speed which is over 90% of the speed of sound at that altitude. At the end of July, Asia is covered in a blanket of rain clouds. So you get the best views when the flight takes off or lands. Today, as I flew out of Narita airport in the morning, the ascent to cruising altitude seemed to take twenty minutes or so. This is long enough to get a lovely view of Japan from the sky. We took off in a roughly north-easterly direction, and then circled back south and west. 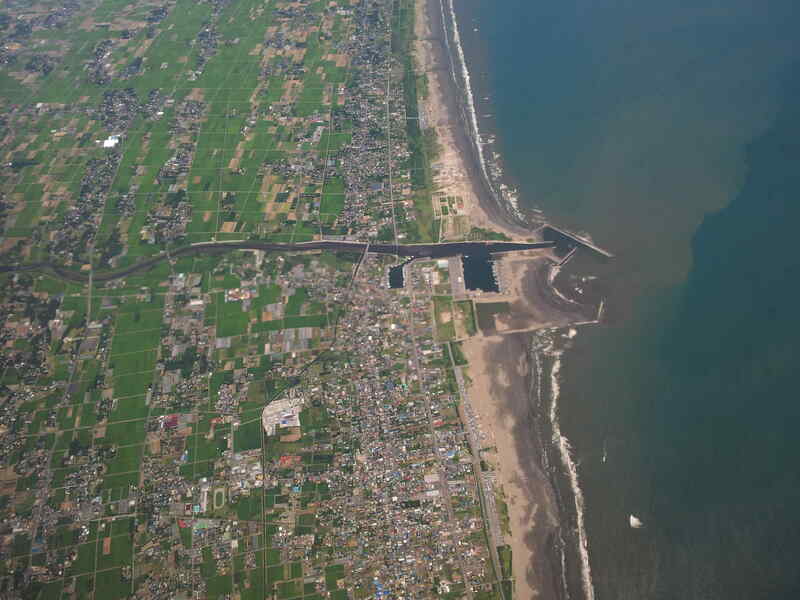 We flew over Kujukuri town almost immediately. The plane was pretty low when I took a photo of the marina (top) and the stream of mud which seems to have been washed out to sea recently. Interestingly, Google Earth shows a similar plume, so this erosion seems to be fairly constant. People were still advised not to go out to sea, so I was surprised to see the wake of a boat in the lower part of the picture, near the shore. We climbed slowly. The most striking sight I saw next was the Tone river with its multiple dams and reservoirs. I took several photos, but the one I liked most is the view over a town which is probably Tsukuba, looking north towards Mount Tsukuba in the distance. The ragged remnants of tropical storm Nangka were too far to the north to affect the weather in the Tokyo region. As you can see in the photo, there are only scattered clouds. It was a great sunny day, and I had a lingering view of Japan as I left. 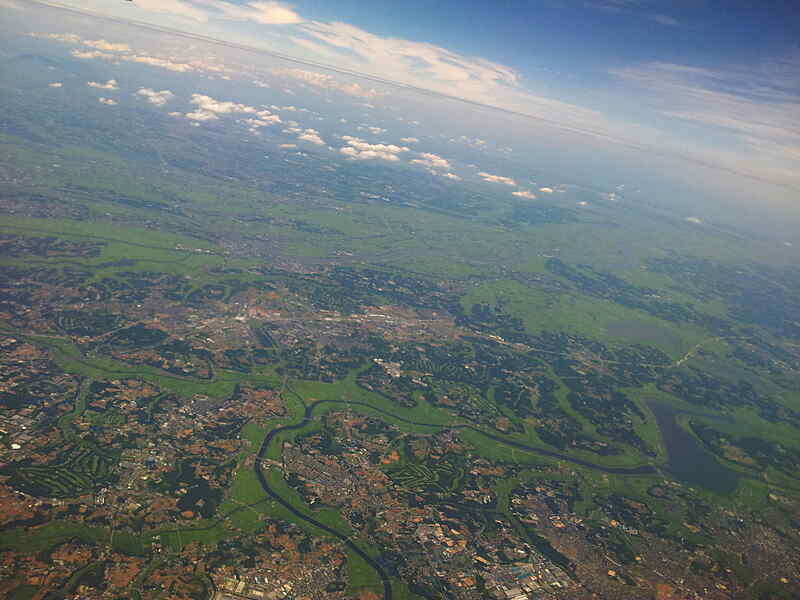 We flew over Tokyo and Osaka. But by the time the craft reached Osaka, we were already above the continent wide sea of high altitude cumulo-nimbus. You feel rootless suspended between the clouds below you and the emptiness of space above you. We dropped below it eight hours later when we landed in Delhi. My week in Japan is over, faster than I realized. As always, I leave Japan with regret. I love the energy of the country. On these short visits there are so many things you wish you had done which you could not. These range from the simple things like taking a look at the statue of the robot Tetsujin-28-go to the more time-critical walk up Mount Rokko. Perhaps I could have squeezed the time out for the robot if the typhoon had not appeared. Another thing I would have liked to squeeze in was an evening of shochu and yakitori with old friends; again, the typhoon warning interrupted that. 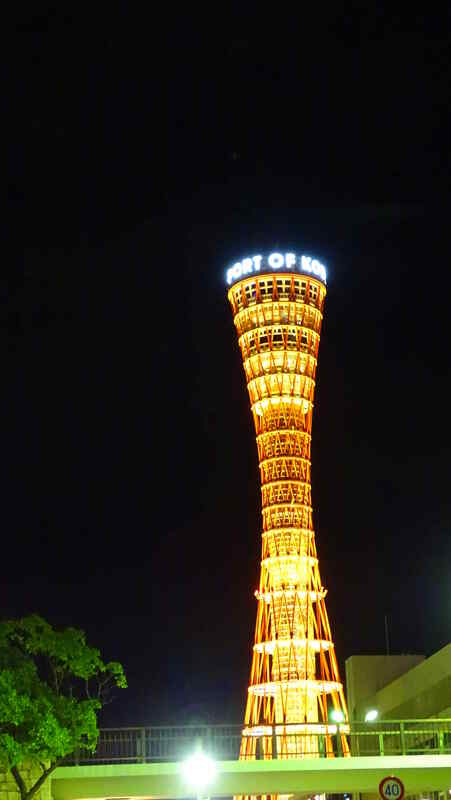 In any case, I managed to walk down to Kobe Harborland and click this photo of the Kobe tower. Leaving was hectic. I had to run out of the last meeting to take the train. When I bought a ticket for the Shinkansen to Tokyo in the morning, the ticket clerk told me to budget around 20 minutes for the subway from Sannomiya to Shin-Kobe. It turned out to take about 5 minutes! I spent the afternoon in the Nozomi going to Tokyo. The Tokyo station is chaotic. I’d left myself sufficient time to get to the Narita Express. Although it says you need to reserve a seat, there is no difference in price between tickets. I’d bought a return ticket on the way out, and the return did not contain a seat reservation. The train was almost deserted, and the conductor didn’t bat an eyelid when he saw my ticket. The shuttle from the airport to the hotel worked flawlessly. Eventually, it took me about 5 hours end-to-end. The hotel has a bar on the top floor with a view on to the airport. I had a quick dinner there, as I watched planes taking off and landing. Tomorrow I have to leave early, so I need to turn in soon. Almost done in Japan. I need to leave Kobe by 3 in the evening in order to get to Narita in time. On our last evening we spent some time in a bar after dinner. A fact which I (shockingly) did not know before my friend the Strong-and-Vigorous told me a couple of months ago is that Japanese whiskys are excellent. It turns out to be a reasonably well-known fact. I was told this by several people over dinner. One of them even mentioned that Jim Murray considers some Japanese Whiskys among the world’s best. Fortunately I retained a little credibility by remembering that Sean Connery had appeared in an ad for Japanese whisky. So we came to a bar which a friend knew and settled in for an evening. Four of us sampled the whole menu between us. From what I tasted and smelt, I can definitely advise you to go out and try Japanese whisky, at least the ones in the menu which I reproduce above. I was thinking of taking a bottle of Sake back to India with me. Now I’m seriously thinking of taking a Japanese whisky back. 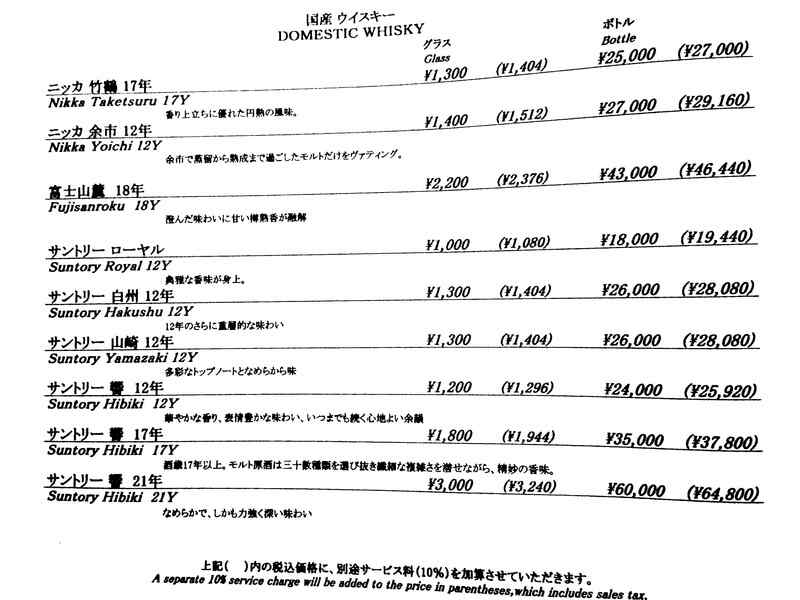 If I have to spend my weight allocation on a bottle of Japanese whisky, then there are only two which I would consider. One was our evening’s starter: the Suntory Hibiki 17 year old. The first taste was smoky, and it ended sweet, but it had a sustained rich and full taste. The other is the Nikka Taketsuru 17 year old. It made less of an impression among the variety we had, except that I caught a good peaty taste. The following night, at a different bar, I had just one whisky, and that was this. Taken by itself it stood out. 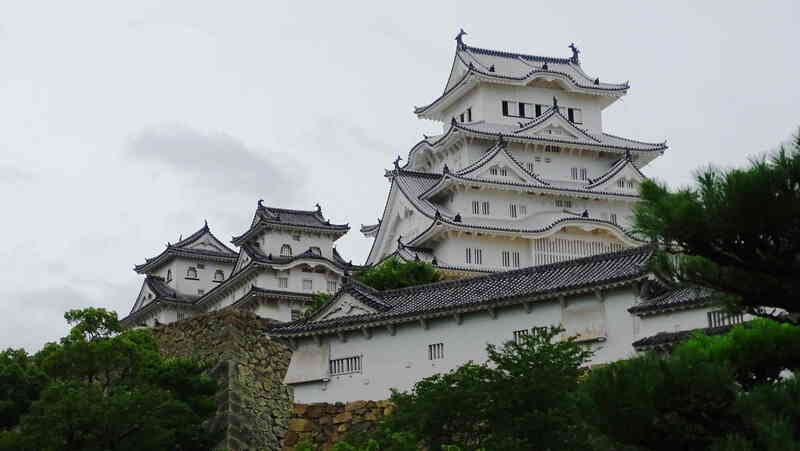 Himeji Castle is one of the most spectacular castles in Japan. I was specially lucky to be there so soon after the end of a five-year period of renovation. I first saw this castle in Akira Kurosawa’s movies Kagemusha and Ran. For years I seemed to remember Toshiro Mifune in Ran walk up to the gate of this castle and order it to be opened. Years later, on a second view, I saw that Toshiro Mifune does not appear in the movie, and the person who gives the futile order is Tatsuya Nakadai. The brilliant colours of Kurosawa’s movies were not in evidence today: the sky was heavy with clouds preceding typhoon Nangka, which is supposed to hit this part of Japan tonight. 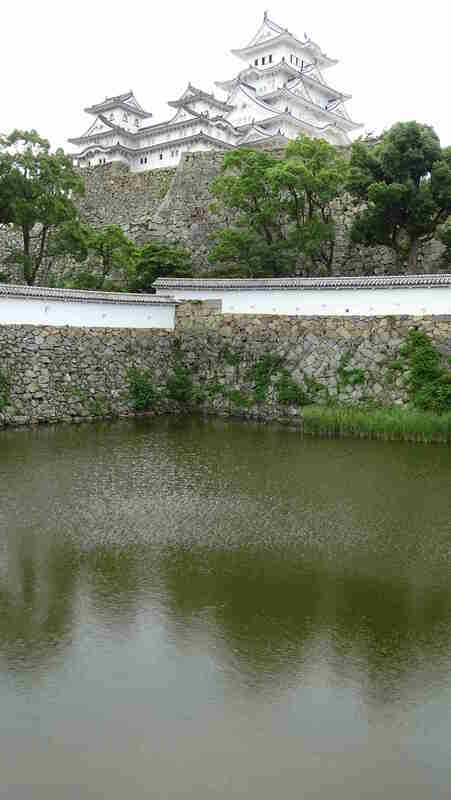 But my first view of Himeji castle was breathtaking. 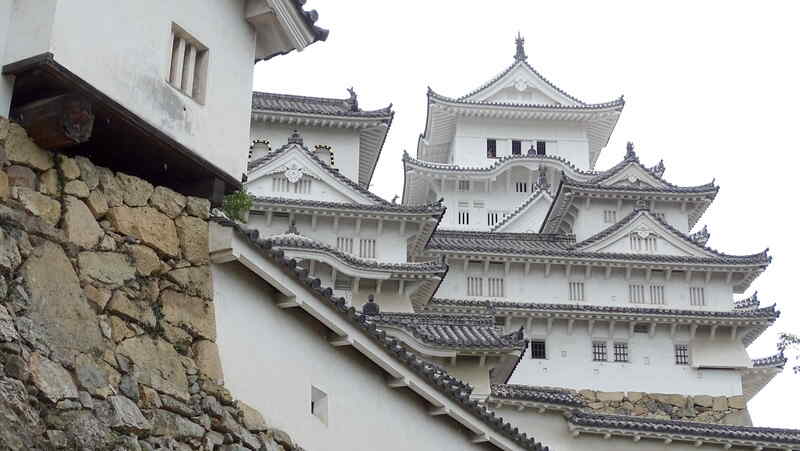 The name Shirasagi-Jo, White Heron Castle, seems appropriate to the imposing structure in pure white edged with black. I climbed 40 meters or so to the seventh floor of the main keep (tenshuku). The castle stands on a stone base, but the main structure is wooden. In about 1610 Ikeda Terumasa, who was given the castle by Tokugawa Ieyasu, finished rebuilding it in its present form. It is now a world heritage site, and a national treasure. When you see it, you have no problem understanding why. It turns out that the world heritage status could have been removed if the renovation had kept less than 70% of the original material, or used design elements or techniques not in keeping with the original construction. Also, several additions made in the 19th and 20th centuries have been removed. The castle is therefore closer to what it was in the 17th century than it has been in the last two hundred years. However, the two main pillars which hold up the seven story central keep have been replaced during the Showa period. The east pillar is reputed to have been a single fir tree, but it is now certainly not a single piece of wood. The west pillar was originally a single cypress tree. During a Showa era restoration a replacement cypress tree was brought as a replacement, but broke during installation. The joint can be seen today in the third floor of the castle. 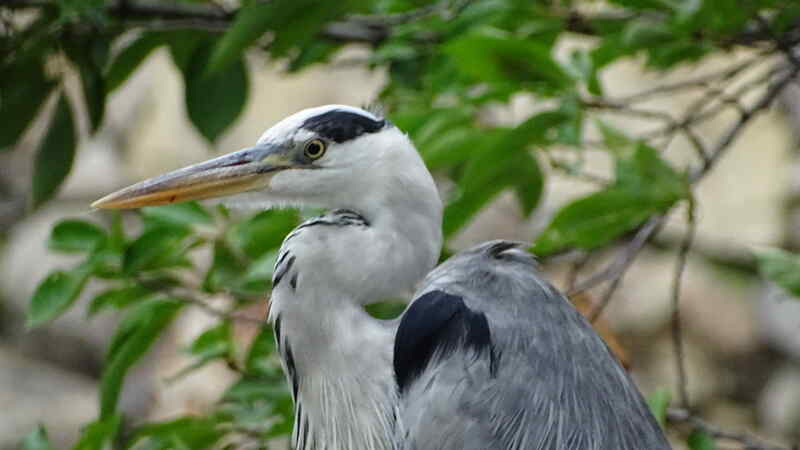 As I left the castle and approached the inner moat I saw one of the local gray herons sitting and looking at the castle. It kept a wary eye on me as I took a close up. The Pacific Ocean has been very active lately. The night I was in transit to Japan, cyclone Chan-hom hit the east coast of China. About a million people had to be evacuated, and there was substantial damage. Now, less than a week later, I’m in Kobe and nervously expecting tropical storm Nangka to hit. At five in the evening I was in Kokoen garden, as the skies opened up for a while. I had my umbrella in my hand, so I managed to reach the pavilion near a pond full of koi without getting wet. The rain is a lovely sight from the balcony of the pavilion. I stood there and watched the koi swim about in the rain. Initialially the rain-drops seemed to confuse the fish, as they kept surfacing thinking that there was food being thrown in. After a while they ignored the rain and swam about just under the surface. The bus back from Kokoen took quite a bit more than an hour, since there was an accident on the road which caused a major traffic back-up. It dropped me near Sannomiya station in Kobe. 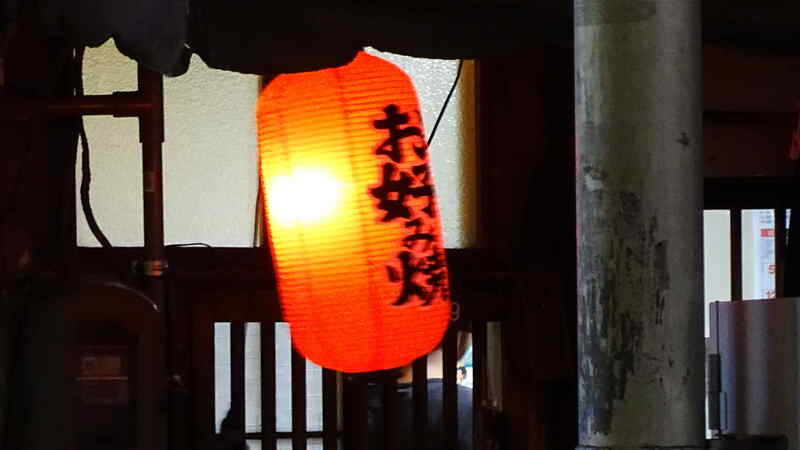 Many restaurants in Japan have red lanterns hanging outside: a lit lantern signifies that dinner is available. The wind was gusty, but not very high. The lanterns were swinging about, but safe. It wasn’t hard to find a nice restaurant. I was with friends: the Immersed and the Bear. The Bear ordered an Asahi beer. The Immersed and I shared a warm Sake. There was a variety of food, all very small helpings. We started with a platter of sashimi, my first this time in Japan. Then we went on to order a tonkatsu, and a plate of grilled octopus. The octopus in a sweetish soya sauce was new to all of us, and we liked it. We were still a little peckish, so we ordered a plate of breaded chicken. Quite a nice small dinner. We went our own ways after dinner. It had stopped raining. I walked back to my hotel by a round-about route. The wind had perhaps picked up a little. The storm is supposed to touch land around four in the morning, a little to the west of Kobe. JR trains are supposed to stop soon. School is off in the Kansai region tomorrow. I will probably not go in to work in the morning, although I guess I’ll take the final call at breakfast. If the city transport system shuts down I could still take a taxi. But if the city thinks travelling is not safe, then it might be silly of me to take a contrary decision. 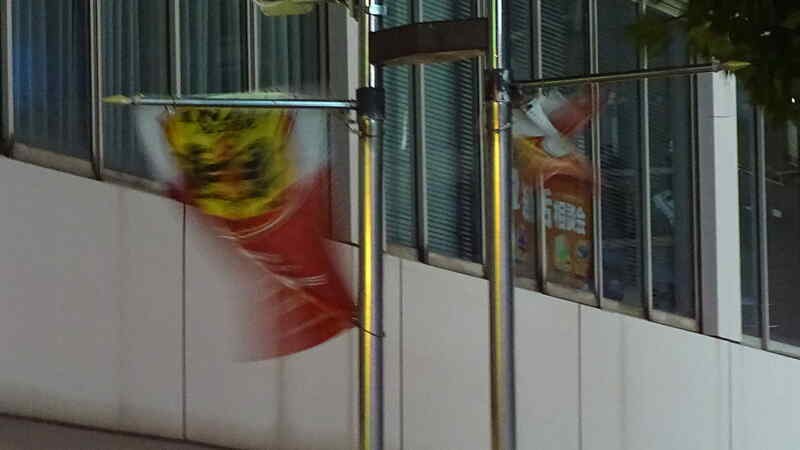 Right now the wind is not very high, although the flags at street corners and snapping merrily in the gusts of wind. I haven’t slept much in the last few days, so I just might turn in early tonight. Nangka was a fizzle. It turned from a category 2 typhoon into a mere tropical storm the moment it hit land. I and my colleagues were rehearsing the survivor stories we would tell back home, but now all we have to report is a day-long drizzle. Great for Japan, but terrible for a blog!